Eight ways to make delightful bags from 2 1/2 inch strips! If you love precut strips such as Jelly Rolls but need ideas for ways to use them, this book is for you. Beautiful bags and totes–designed exclusively to be made with 2 1/2 inch strips–are loads of fun to make and give your wardrobe a happy lift. If you can sew a seam, you can sew a bag or tote that is totally unique to you! Add odds and ends of beads, buttons, and trims to make a personal fashion statement in no time flat. Full-size templates and all the directions you need to sew give you a fashionable place to stash your cash. And they make great gifts, too! I have seen the whole book, borrowed from the library, and it is delightful. 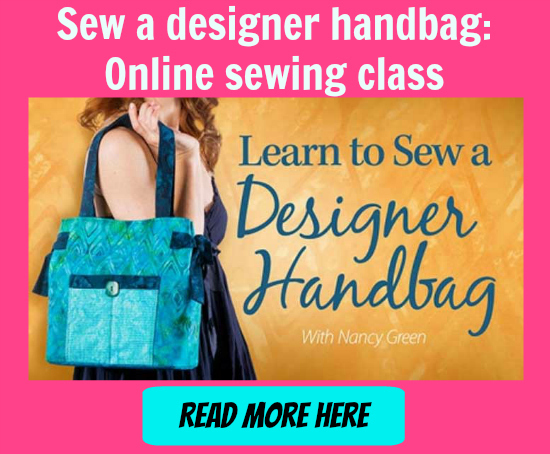 I have made purses and bags, among many, many other items, and this book is full of simple, fun ways to put fabric together to make cute bags. I am thinking about making the water bottle carrier, as we re-use water bottles and always carry one, usually in my husbands pocket—gets warm quick—or my purse, which is an obvious problem if it is a humid day. If I could just throw a little carrier over my shoulder, problem solved. I like the author’s suggestion of using template sheets to construct bags, too.